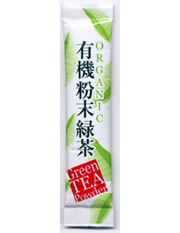 Organic Sencha green tea powder conveniently dissolves in either hot or cold water with light stirring. Its dark green liquid tastes very similar to a good quality Sencha loose leaf tea. Each serving is 100% Shizuoka organic green tea powder packed in a handy stick foil packet that is ideal for use at home, work or on-the-go. Organic Sencha green tea powder has been produced according to the strict guidelines of the JAS (Japan Agricultural Standard) and is certified organic. Purchase 100 Organic Sencha handy stick packets without the box and save 20%. Each tea powder serving is individually packaged in a foil wrapper to insure freshness. Packed in a cellophane bag for convenient storage. Instructions: Add the contents of one packet to 100 ml of water and stir. 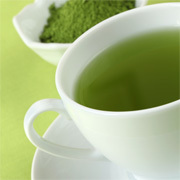 Please Note: Organic Sencha green tea powder dissolves immediately in hot or cold water with very light stirring. In cold water you may notice small beads of undissolved powder at the top, which are not bitter tasting and very healthy. If not consumed right away, some of the powder will settle to the bottom or your cup, so simply stir again if desired.